Although I wrote everything I know about squirrel issues for this website, oftentimes a problem with squirrels in the attic is beyond the scope of the do-it-yourself homeowner to solve. I have found a professional company in Annapolis, Maryland that handles problems with wildlife. 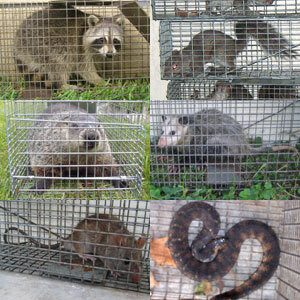 Adcock's Trapping has access to tools, techniques, and experience that help them do a far better job at wildlife removal than a non-experienced homeowner could. They possess licensing that allows them to do certain types of work legally, that non-licensed homeowners in the state of Maryland are not allowed to do. For the welfare of your situation, and the squirrels, in some cases it's best to hire a pro. There are good companies and bad companies out there. I've done research on such companies, to get to know them, and feel confident recommending their services. I therefore recommend a company called Adcock's Trapping which services Annapolis, Maryland. If you have a squirrel problem, or any other conflict with a wild animal, and live in Annapolis, I am confident that this company, Adcock's Trapping, is the one to call. I asked the company to describe their service range, and they said this - Our service range includes the greater Washington District of Columbia area, including the suburbs and several towns, including wildlife animal control in Clinton, Upper Marlboro, Bowie, Waldorf, Mechanicsville, Fort Washington, Leonardtown, St. Charles, and more. Adcock's Trapping operates 24/7, so don't hesitate to call at any time to discuss your wildlife problem, and schedule an appointment for same-day or next-day service. First, thank you for such an informative website. I purchased and am living in a 90+ yr old fixer-upper farmhouse that was unlived in for approximately 2 years. Needless to say, the smart wild creatures figured it out and moved in during that time. Although I have 6 indoor cats, and one flying squirrel was "grabbed" by one of my cats out from under a closet door which has an opening to the attic (but escaped after screaming and hissing and wedging itself between the wall and a cabinet), there is some kind of squirrel in my walls every afternoon and night playing soccer with a nut or some other round item. Don't know if it's the same squirrel or not, but it has to go. My question to you: Because it's December, do you think I should be concerned about babies? I haven't been in the attic at all, and really don't relish the idea, being by myself, but I have to get this done now. The repellant ideas sound great, but really, if a house with 6 very predatory cats doesn't deter this guy, a little urine in the attic isn't going to, either. There are 3 cat boxes in the house already! OK, so tomorrow I'll try to find the entrance/exit holes into the house. I have a Havahart trap, but I truly cannot climb up by the roof, so maybe I can work from inside the attic. Whatever, at least you have given me some more information and tools to try. Thanks so much for caring about the squirrels. I was shocked at the response from wildlife officials when I inquired about removal of my groundhog, when they informed me that the groundhog could not be relocated but had to be destroyed. WWWHHHAAAAATTT?!?!?!? That's when you decide to let sense take over and just do it yourself. How ridiculous. He was just being a groundhog. And, these squirrels are just being squirrels. And I agree, after observing and living with all kinds of animals for 53 years, that many animals do have emotions. You're a very unique person and I know the furries appreciate your speaking on their behalf. PS - I also had a groundhog residing in the basement who had an amazingly constructed burrow system. I believe he exited after a pitbull owned by a contractor who brought him while erecting fencing for my goats, allowed the pit to go down into the basement unattended and dig up a portion of the burrow. If you have a squirrel problem in Anne Arundel County Maryland, or any other conflict with a wild animal, I am confident that we can solve it. We use humane methods when dealing with Annapolis wildlife removal situations. Squirrel Control Annapolis. Our company is fully licensed and insured in Maryland. Call us any time at 410-774-5789 for a price quote and to schedule a same-day or next-day appointment to solve your squirrel problem in Annapolis.